I got this idea from the best party site – this one! 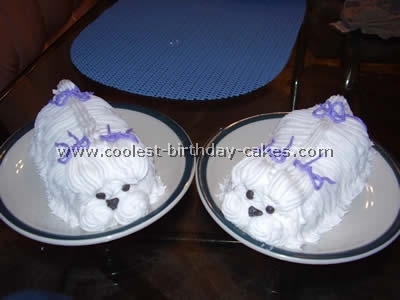 Even though it may look difficult to make when looking at the birthday cake picture, it’s fairly simple to make. I used two boxed cake mixes – one 9×13 pan, and one loaf pan. I used two containers of chocolate frosting. 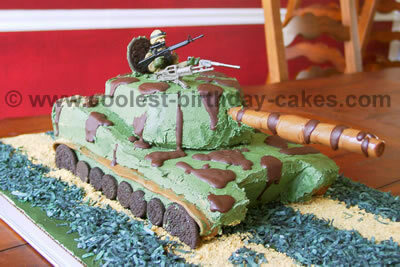 For the green camouflage effect, I used green spray frosting purchased at Michael’s Craft Store. Oreo cookies for the wheels, black licorice for the tracks and smashed Oreo cookies for the dirt surrounding. 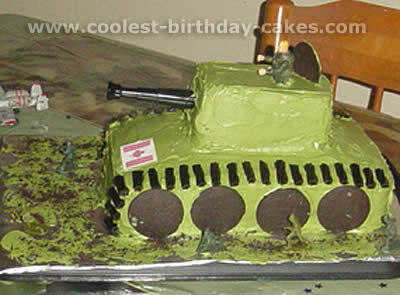 The cannon was from one of my son’s GI-Joe tanks, just stuck it right into the cake. I placed some green army guys around for decoration. I served huge slices to 15 kids and had almost half the cake left over. I could easily serve 30 if using these size pans. I used a 13 x 9 pan for the bottom, and a loaf pan for the turret. Thin mints were used for the wheels, and a Hershey bar for the treads. A pretzel dipped in chocolate was used for the barrel. 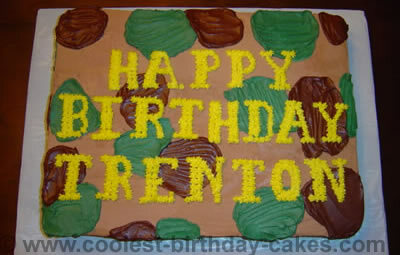 My son wanted his cake tan with green camouflage, but this is the closest I could come to those colors. 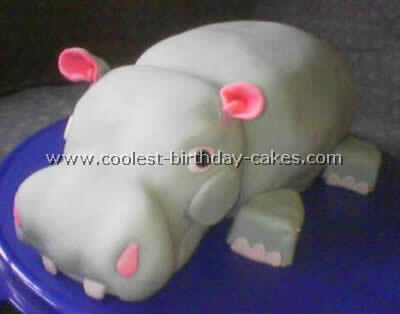 I hope my birthday cake picture helps someone out. This is an easy cake to make, apart from the icing! I used three rectangle trifle sponges. Jam two together and cut to the size of the base of the tank. Cut the 3rd sponge to the size of the top of the tank (I cut it in half, then a bit off the back). Jam it on top of the base. Make up 3 different green coloured icings and ice it army style (you have to do this fast so the icing doesn’t start to harden). Freeze the trifle and ice frozen to stop the trifle from crumbing into the icing. A chocolate licorice log worked out the best for the big gun at the front. 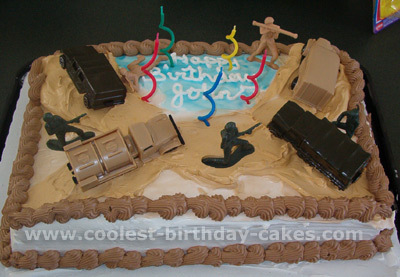 Cut a "port hole" to put the army driver in at the top of the cake. The wheels were done with "Mellowpuffs" (unsure what these are called in America, cookie with marshmallow covered in chocolate). 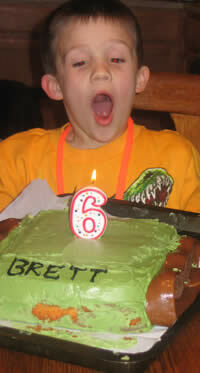 Voila, Mr. 5 loved this cake, best one yet! I baked the cake in a 13×9 pan and cut approximately 1/3 off to use for the top of the tank. 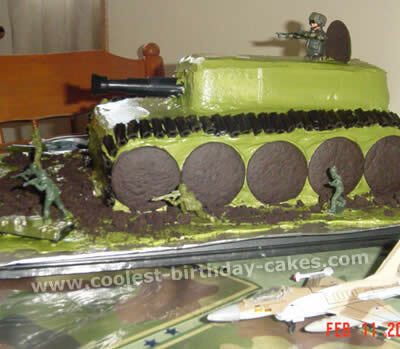 Frosted it green, swirled some army-ish colors on it to make it look camouflage, and stuck a candy stick in it for the big gun. I then put my son’s initials and age on it for the army tanks number, and used graham crackers crumbs and Raisinets all around it- for the dirt and boulders. Oreo cookies were used for the tires. I scattered misc. army men around it and voila! I also used a Necco wafer on top for the entrance hole. The boys thought it was very cool! To make the cake, I used 2 box mixes. I used my P.C. stoneware roasting pan lid for the base and my P.C. stoneware loaf pan for the top. Once the cakes were cooled, I placed the loaf on top, slightly to the back of the base. I then froze them overnight. The next day I used a knife to "sculpt", cutting the corners off the front of the loaf cake, rounding the back corners and cutting the front of the base to create a "headlight" area. I used brown and leaf green food coloring to tint 2 cans of white frosting. The crawler treads are the 6-8 inch Toostie Rolls. I set them on my stove while the oven was preheating to soften them a bit. I then rolled them out to an appropriate length (that took a bit of arm muscle) and set them onto the sides of the cake, using chocolate sandwich cookies to help hold it up. The cannon is also a tootsie roll. I used 3 straws cut lengthwise and wrapped around each other (for extra strength), cut a slit down the center of the tootsie roll, and put the straws inside. I used a knife to "dig" a hole in the front of the loaf cake (my cake was still frozen) I then placed the tootsie roll in the hole. I did have to shove some of the cake I cut off during sculpting into the hole to help hold up the cannon, but I hid it with frosting! I used black frosting in a tube for the writing and cranberries for headlights (I planned on M&M’s but forgot them at the store) I also used a chocolate sandwich cookie for the hatch on top, and one of my son’s toy guns for added details. 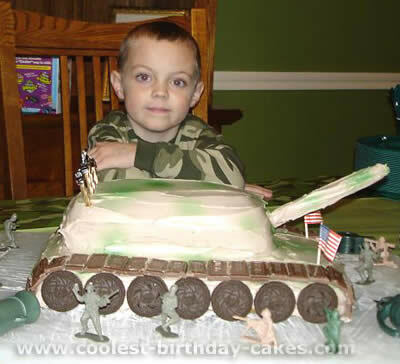 Thanks to your site and the wonderful ideas of each birthday cake picture from others, I was able to make this cake for my army loving son who just turned nine. I couldn’t have found anything as wonderful to help me out with this. My son was tickled and that made it all the better. Thanks again. I made the cake twice in the same week. He celebrated one with his cousins and one with his friends. For the icing I used four containers of Betty Crocker, whipped fluffy icing, tinted with Wilton’s green and brown, to give it more of an army green. This was enough for me to decorate two cakes, so for one that much won’t be needed. For the tracks I cut up black licorice, and the wheels are Wafter cookies. The army gun is a pirate party favor telescope, and of course I couldn’t forget the army troops. Thanks again to everyone who shared their ideas, I had a great time twice over. 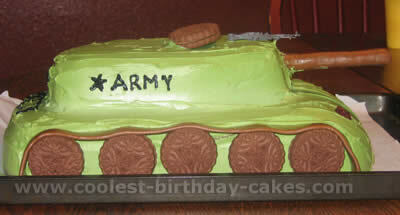 I made this cake for my son’s fifth birthday as he wanted an army themed party. I used a 9×13 cake for the bottom, a loaf for the top, a frosted pretzel rod for the cannon, Oreos for wheels, and pieces of Hershey bar for the tread. The icing was made tan by mixing chocolate and vanilla icing. 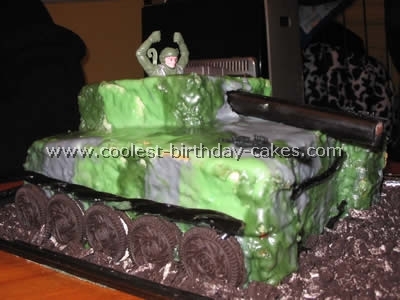 I sprayed it with green spray icing for the camouflage look. It was a hit! I used a 9×11 glass dish for the bottom of the tank. I used a glass, loaf pan for the top. I shaped the top using dental floss; I also sliced the "loaf" of cake in half. I iced the whole cake with regular white vanilla icing. 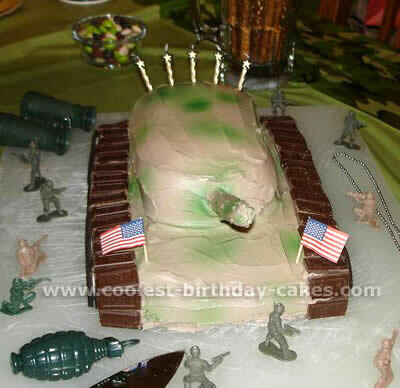 I used the computer and printed the US Army, cut it out, and stuck it into the icing. 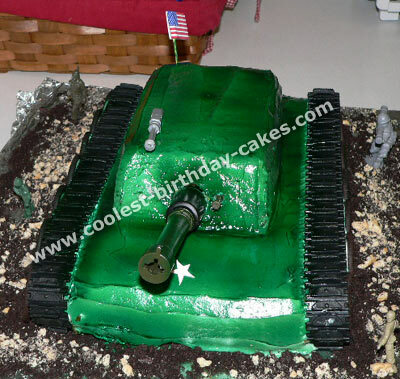 As you can see in the birthday cake picture, I used a green colored spray icing and colored the whole thing, I did spray heavier in areas then some for a more camouflaged look. It turned out pretty nice. To top it off I crushed Oreos and vanilla cookies for the dirt, and used some army guys from my sons stash! 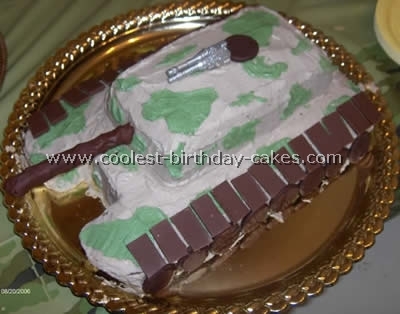 To make this tank birthday cake for my 5 year old son’s birthday, I first I got two 9×13 pans to make the two layers of the cake. 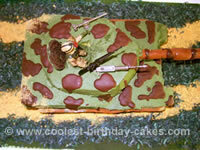 Then I used a 3×9 pan to make the top of the tank. 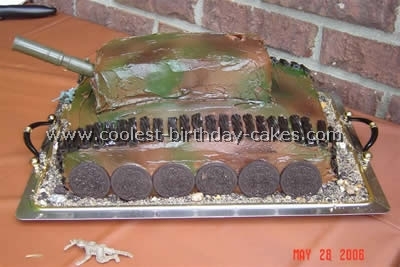 I stacked the two long pieces on top of one another and then set the small piece on top 2 inches from the center of the cake so it would look like the top of a tank. Then I got black, green & brown food coloring for the camouflage. I used 3 cans of vanilla icing and put each in a separate bowl. I then put the green, brown & the black food coloring in each of the bowls. I mixed the food coloring until it got to the color I wanted. I then took a butter knife and took turns with the colors to ice the cake. 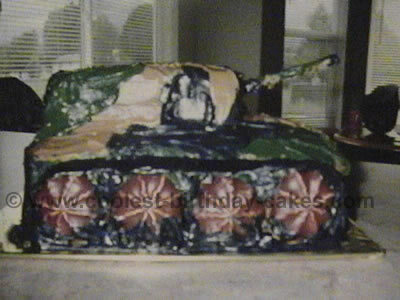 Then I got "little debbie’s" chocolate marshmallow cookies and used them as the wheels for the tank. I put four on each side. Then I put the black icing around all the tires to make it look like real tires. About 2 hours before the party I stacked the cakes and started mixing the icing colors. It took about 35 minutes to ice the cake with an accurate amount of each color. Then it took me about 30 minutes to add the straw, wheels, and foil tracks. 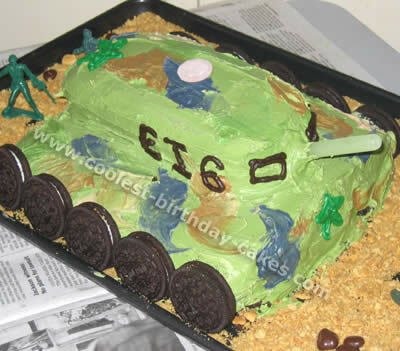 Here’s my tank birthday cake picture. It was super easy to make. Prepare two 8×11 cakes (this one is 1 yellow & 1 chocolate) and prepare one 6" round cake. Once cooled, freeze the 8×11 top layer to make it easier to cut the cake at an angle as shown. The cannon is a pretzel rod dipped in melted chocolate icing. The wheels are double stacked chocolate covered grahams (couldn’t find round cookies large enough). I used Wilton tip 789 to create the "tracks". This cake was made from a half sheet pan. My son and I made this for a Cub Scout son and one cake competition and won first place. The cake sold for $55 at auction. 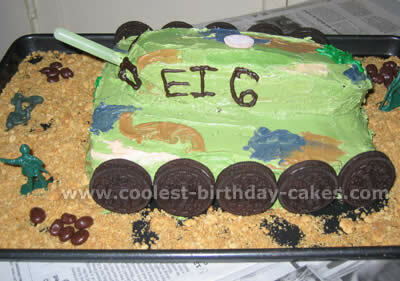 As you can see from the birthday cake picture, the tracks and barrel are made from tootsie rolls and the only other details were the Oreos for wheels. 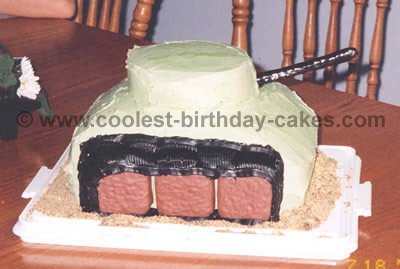 I looked at a picture of a tank and cut out the cake bottom from a 9×13 pan. The Turret is an oval cake pan trimmed to a proper size. The soldier is a 1.00 army man from Walmart. The tracks are painted bubble tape, and a leaf tip to make bumps along it. The "tires" are Oreos, and the gun is a painted pretzel rod. 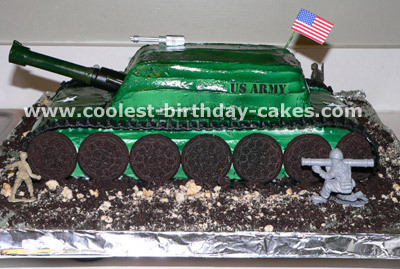 The Turret lid is an Oreo covered in icing. The flag is a computer printout stuck to a toothpick.